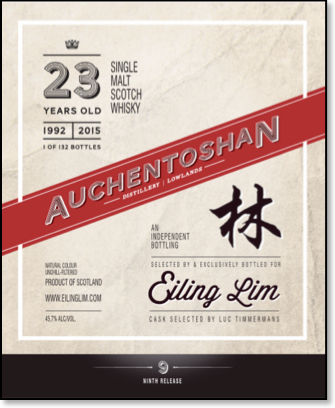 Finally, I’m able to announce the 9th Release of the Eiling Lim whisky range and it’s a wonderful 23yo Auchentoshan distilled in 1992 and bottled 2015. As most whisky aficionados would know that the Auchentoshan distillery is one of the 6 functioning distilleries in the Lowlands. Its name in Gaelic means “the fields of the corner” and the distillery is established in 1800. Today, the distillery is owned by Beam Suntory Inc. Many would call an Auchentoshan a breakfast whisky because of its sweet and delicate nature. This is indeed true because the Auchentoshan distillery uses a triple distillation method which creates a fine and delicate whisky as the end product. It is indeed quite rare to see independent bottling of Auchentoshan and I was lucky to be able to choose one from the two Auchentoshan samples I’ve received months ago. I felt that now is truly the right time to launch this whisky because it is a whisky for the summer! The whisky has a light golden colour. On the nose, you get a lot of interesting aromas which include a fresh and vibrant nose of apples, gummy bears, mint in the summer breeze and an underlying sweetness. On the palate, I get a fruity sweetness, minerals, refreshing menthol, waxiness, light, refine and delicate with a medium long finish. It’s a pure whisky that I would take in big sips! What a whisky for the summer! With only 132 bottles, grab them while they are still available.